The commission created a Green Champion recognition program to recognize the outstanding environmental achievements of individuals, groups, organizations or businesses in Villa Park. The commission selected Bill Karges, lifelong Villa Park resident and manager of Pioneer Garden and Feed, as the first recipient of the Green Champion recognition award. Bill has been an outstanding example and a resource in the community for residents interested in composting, water conservation and gardening in an environmentally friendly way. 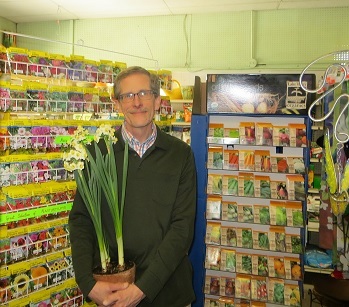 Attendees in educational programs that he has presented and customers at Pioneer Garden and Feed in Villa Park have benefited from Bill sharing his extensive knowledge for the past 43 years. Bill, a graduate of Iowa State University with degrees in Botany and Communications began his love of gardening at a young age. When he was nine his parents dug him his first garden bed. At age 13 Bill, who was tall for his age, had already been asked by John Leston, founder of Villa Park’s own Pioneer Garden and Feed to begin working there. Over the years John kept asking him to come back until finally Bill gave up other jobs and made gardening his full-time career. “We owe it to ourselves and to all life on the planet, to be better stewards of whatever part of the earth we call “home”. Because no one really owns the earth, we have the great responsibility of passing it on to the next generation in better shape than the way we found it,” Bill said. The Villa Park Environmental Concerns Commission advises the Village President and Board of Trustees on matters relating to the preservation, protection and improvement of the environment, including the quality of land, air and water.